Geneviève presents workshops that are clear, concise, inspiring and beautifully focused on the details that matter. She has the leadership skills and movement experience to accurately redirect perceived difficulties into positive outcomes for each student without losing the concentration and focus of the group, or the workshop itself. -Diana Bailey Founder & Director of Essential Motion Inc. Body Fundamentals is a boutique Pilates and Movement studio. We specialize in Classical Pilates and Pilates Post-Rehabilitation. Additionally, we offer Holistic Health and Wellness services to complement your Pilates programs. Wellness services include: Private Lifestyle consulting, the Chopra Center's Perfect Health Lifestyle Program, Meditation, and yearly retreats. Private (one on one), semi-private (2 people), quartet (4 pp) sessions and small group Foam Roller classes are taught in our Tucson Pilates studio. Weekly Master class equipment Quartets are taught by Genevieve to Pilates Instructors and Teachers in training. Visiting guest instructors are welcome. Private and semi-private sessions on the apparatus are tailored to students needs and goals. Our aim is to provide you a whole body movement experience in a serene environment while teaching you the fundamental principles of Pilates. 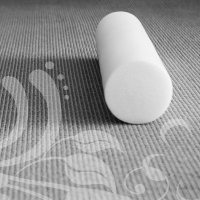 Foam Rollers are a great tool for balance, alignment, postural correction and pain relief. Geneviève personally uses the roller every day. Over the past 26 years, she's designed Foam Roller Workshops and customized client programs for back care, alignment and recovery from injury or surgery. She uses the Roller daily with clients in the studio and is continually surprised with how quickly it helps realign the spine as well as stabilize the pelvis and strengthen core muscles. Using the philosophy and science of Ayurveda as the foundation, private sessions focus on an assessment of your specific needs. You’ll learn how to restore balance physically, emotionally and spiritually. 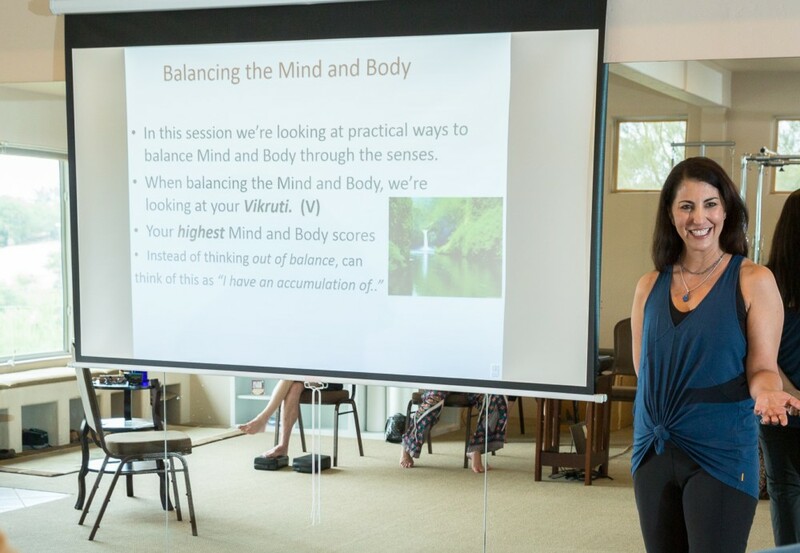 Through identifying areas of imbalance we will introduce tools to help you re-establish balance from the inside out. If your goal is better health, increased energy, self-healing, anxiety and stress relief, or learning to develop stronger relationships, call to schedule a private consulting session. * Consultations may be done in person or via Skype. Group training for businesses that focuses meditation, mindfulness, and movement are available. To discuss your company’s training goals, please email Geneviève. *All private sessions are confidential. The Perfect Health program was developed by Drs. Deepak Chopra and David Simon and represents the integration between the principles of modern science and insights from the world's timeless wisdom traditions. As your Chopra Center Instructor in the program, Geneviève will guide you through five distinct lessons that teach you a powerful regimen of Ayurvedic and Holistic Health practices that teach you to bring balance and healing into your life. practical techniques to balance body and mind. In this introduction to meditation, participants will learn the benefits of meditation, as well as an introduction to different types of meditation. Students learn to recognize the primary stress responses, and how those responses immediately impact our physiology. Participants will be given tools to increase awareness of these responses with specific attention to recognizing the “fight/flight: response, and how to change it. The course begins with a short educational segment on meditation. There is instruction to mantra meditation technique and attendees will be led through it at each session. 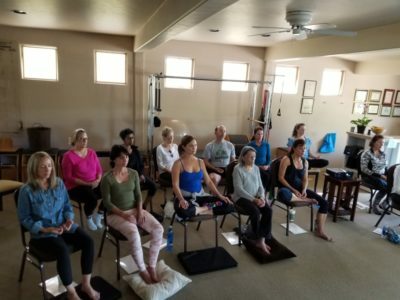 Breathing techniques are part of each session’s practice, as will learning techniques for relaxation, calming and energizing. Chair Yoga or Standing yoga sequence per your request before guided instruction is part of the curricula. Each class ends with intention setting for vibrant health, mental clarity, and greater peace and well-being. Students also learn experiences during meditation, what to expect and how to deepen their home practice. The weekly practical meditation experience will help students not only create a home practice but encourages mindfulness at the office with their fellow employees. Receive clear guidance for living a spiritual life in our secular world.